Do you know why I finished this book? I can tell you, it’s alright. I finished this book for the sole purpose of being able to review it. PICK UP A DIFFERENT BOOK. THIS IS NOT THE BOOK YOU ARE LOOKING FOR. There is NO action/adventure. There is PRETEND action. The war mentioned in the synopsis? Yeah, don’t fall for it. There is no war. It is literally someone declaring war, hearing a mini speech from a seventeen year old girl (the speech would’ve taken less than THIRTY SECONDS to say), and almost immediately rescinding it. Don’t even bother. Also, side note: The word ‘yell’ was used 45 times, mostly in situations where you wouldn’t yell, just maybe talk sarcastically. The word ‘scream’ was used 30 times. Do a lot of people yell and scream around Vernon? What’s up with that? The great romance? Haha! Where is that? This is nothing but lust-filled stares and kisses. Lust makes ALL of the decisions between Alex (the main character) and the love interest. There is not a single rational thought between the two. And Alex keeps comparing her love story to Romeo and Juliet. STOP. DOING. THAT. Yes! I know that sometimes when you’re lurking on Facebook, you’ll see some teen actively declaring their romance is “Just like Romeo and Juliet! Love you baby <3” but that is NOT how the average teen acts. We DON’T go around comparing our love story to a tragedy that ended in MULTIPLE DEATHS. It’s NOT cute. It’s NOT sweet. And none of this is love. The only reason why this comparison might be reasonable is that Romeo is about 18-23 (estimate), while Juliet was around 13 (or 14). Alex is 17. Guess how old her love interest is? Haha, you’ll never guess. He’s at least seventy-six years old. Oh, is that creepy? No no, don’t worry! It’s kinda like Bella and Edward. It’s alright, he still looks eighteen, so that makes it all better. Alexandria: There’s nothing great about her. I don’t see why she’s even in this book. She is an irrational, idiotic and irresponsible danger to society. What could she have possibly done to deserve such a description? Got her father to get her an internship at his place of work, didn’t read any of the rules that pertained to her being there, and then, once someone told her of a couple of rules, she proceeded to promptly and publicly break them. Confront a person she just met, maybe two weeks ago (there is NO mention of how much time has passed in this book, so who knows! ), for lying and keeping secrets from her. Do you tell people you just met your worst/most private secret? Point and shoot a stolen gun at a door and hope she doesn’t hit anyone. Steal a government aircraft and use it recklessly. Since when do you care about who I date? It’s not like you’ve really been in my life for the past seven years and now you want to come play the overprotective dad? In fact, [love interest has been] there for me more than you ever were. He actually does care about me and isn’t just forced to do it because he got my mom pregnant. There you have it, folks. A coworker, who she barely knows, has been there for her over the course of the summer, more than her father has been there her entire life. And she’d apparently sure that half of her love interest “being there for her” isn’t just her feeling lust for him. Oh, and she never apologizes for this. Speaking of lust, can we talk about how authors always want to talk about heat pooling into the heroine’s stomach? Doesn’t anyone find that gross? I don’t want to hear about where heat or, in this case, “a warm electric cloud” is settling. If you describe a guy and it’s clear you find him incredibly attractive, I can connect the dots myself (I just don’t because it’s an extra step I don’t care about). Gavin: This guy was creepy and didn’t belong in the book. At first I thought Alex was just being harsh to him, but no, Vernon made him a scarily creepy “nice guy.” And I totally understand that there are those exact kind of people out there in the world, but I just didn’t see any reason why he needed to be included in the book besides (possibly a spoiler) a really weak love triangle. Riley: Ah, the easy villain. From the very beginning, Vernon made Riley the conflict scapegoat. I bet Riley is a nice enough girl, but Vernon made her appear mean and nasty so that there was some conflict for Alex to deal with until the “real” conflict arrived. It was sad and I hate to see a character treated that way. Jen: Jen is the ONLY character I didn’t hate in this entire book. In the brief “book time” she had, she was (usually) sensible (up until the end parts anyway) and I actually kinda liked her. The book would have maybe gone better if she was the star and didn’t make all of the stupid mistakes Alex did. The rest of the characters were forgettable and ridiculous. Why do a bunch of adults listen to a raging seventeen year old who clearly has no sense? You know what they said after Alex shot a hole in the door? That she was a great shot and could be useful in the army. There was only one part of the book that I found interesting that was sci-fi. Everything else was just repeated three word sentences with weak description. The love interest had the most description of any of the characters, go figure. A part of the book that made me furious was Vernon not only having a character compare this Romeo and Juliet lust-war to America before the Civil War, but having that character be the only character that’s a person of color. First of all, racism is ugly, but can definitely be mentioned or used in a book, but it always has to be done properly. Comparing humans and aliens being frowned upon for dating to the racism people of color experienced before (and let’s face it, after too) the Civil War is in extremely poor taste and judgement. That’s not comparing apples to oranges, that’s comparing apples to bears. You don’t do that. It doesn’t make sense. This book isn’t Defy the Stars, it’s Defy Authority and Make Poor Choices While Still Getting a Happy Ending, a self-help book written by Alexandria. Would you Recommend Defy the Stars? Please don’t ask me that. Hmm. I really like the cover, but the romance doesn’t sound all that developed. I’m weary of giving it a try now. Thanks so much for an honest and awesome review! Hi Breeny! Thanks for commenting, welcome to the blogging community! I’ll be sure to come up with some tips! I agree! Your help to make us avoid that kind of sadness caused by that book is SO much appreciated, Paige! 💕 Yay! What are you currently reading? The current ARC I just picked up was so boring I’m thinking of opening another one that’s hopefully good. I’m reading a book called I Want to be a Superhero! I don’t think it’s an ARC, but I received a copy from the author! Im loving it! Heat in the stomach sounds like someone needs some Pepto. Gross. Definitely steering clear of this one! What’s Gray’s book? There were a bunch of books the same name when I looked this one up on Goodreads, but I didn’t pay attention. 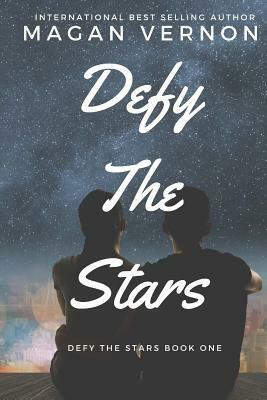 Claudia Gray’s Defy The Stars: it’s a big deal right now in YA science fiction! That’s one you should check out for sure!! I’ll look it up! Thanks for the recc!